- For Directions and Parking information visit www.urbanpirates.com/nationalharbor_directions. - Arrive at the Capital Wheel Pier at your listed check-in time. Check-in at the pirate ticket kiosk by giving your name. Each ticket holder will receive a wristband from the ticket kiosk and will be asked to wait for the ship to return. Early check-in in suggested as most of our cruises run back to back with a cruise before and after yours. Have your group meet at the dock to prepare for departure. - There are no open alcoholic beverages allowed on the dock or in the street. Passengers observed drinking before boarding will not be allowed on board. - Once the ship is reset the Captain and crew will welcome you aboard the ship. Once aboard the ship activities include pirate dress-up (vests and sashes) and tattoos. - The pirate ship will depart promptly 30 minutes after check-in time. Passengers who have not checked-in 10 minutes prior to cruise departure will forfeit their reservations. No refunds or rescheduling will be issued for passengers who miss departure. Urban Pirates reserves the right to refuse service to any person deemed unsafe to sail. - Group Tickets - Group and package reservations (of 20 passengers or more) may be canceled, altered, or rescheduled up to 14 days prior to cruise date. No refunds will be given or reservations rescheduled for group cancellations made with less than 14 days advance notice. A one-time $100 cancellation charge will be applied to any canceled group reservation with 14 days advance notice or more. 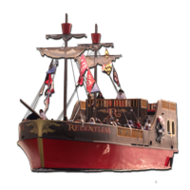 - The pirate ship will not sail with less than 15 passengers on any cruise. 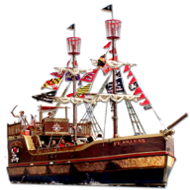 Should Urban Pirates need to cancel a cruise for any reason, you will be contacted in advance when possible and issued a rain check in the form of a gift certificate. - The pirate ship sails Rain or Shine (we will sail in rain.) Please plan to dress according to the weather including rain jackets, ponchos, and umbrellas. If the Captain deems the weather unsafe to sail (ie thunder, lightning, high winds) and a cruise must be canceled passengers will be notified by phone prior to the cruise and rain checks will be issued in the form of a gift certificate. If a cruise is interrupted by unsafe weather conditions and the boat must return to the dock rain checks will be issued in the form of a gift certificate depending on the length of your sailing. - By law, the Coast Guard authorizes us to carry a maximum of 60 passengers. This number includes all persons, regardless of age or size. All riders, including infants, must have a ticket purchased for them. There must be one responsible adult per party. - Gift Certificates can be purchased for any number of tickets for any given season. Gift Certificates/ Rain Checks are non-refundable and have no cash value. Gift Certificate/ Rain Check expiration dates can not be extended.